The Avalanche roll to victory in their inaugural season in Colordo, while the Cinderella Panthers make an unlikely run to the final in Florida's Year of the Rat. The 1995-96 NHL season began as The Year of the Rat and concluded with a Mile High Stanley Cup victory. In their first two seasons the Florida Panthers nearly made the playoffs, missing by a single point each year, and in Year 3, not only did they make the playoffs, they went all the way to the Stanley Cup final. The Detroit Red Wings, meanwhile, came within a point of matching the NHL’s single-season record for most points in a season, racking up 131 courtesy of a 62-13-7 record, but they could not stop a juggernaut that was playing its first season in Denver after relocating from Quebec City. The change did them good, as the Avs overpowered the mighty Wings then swept the Panthers for the franchise’s first Cup. For many, Florida’s rise to prominence was shocking, but not to the players. 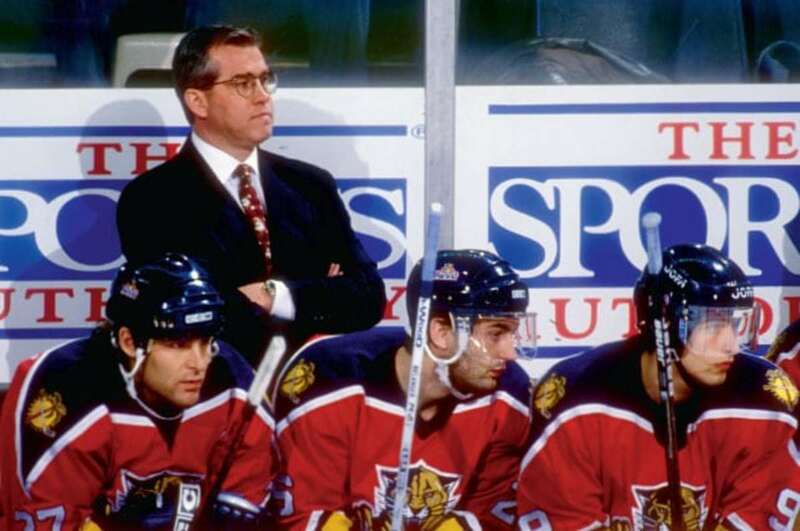 Doug MacLean had replaced Roger Neilson as the Panthers coach and while his system retained a lot of what Neilson taught the players about defense, he allowed them to explore the offensive side of the game a little more. Doug MacLean, coach, Florida: I called Brian Skrudland, our captain, after I got the job and he said, “Doug, I’m telling you, you’re going to be shocked when you go on the ice with our team and get a feel for how good we can really be.” It really fired me up. Brian became a really valuable guy for me. Scott Mellanby, RW, Florida: The one thing I find funny is people would say we had a miracle year and it was in a lot of ways. But the first two seasons under Roger we missed the playoffs by a point and we were such a well-coached team with the trap system that when we got one-goal leads, it was over. When Doug came in we had an influx of young guys like Radek Dvorak, Ed Jovanovski and Rhett Warrener to go with the older guys. We were ready to win. We were a really good team for four years. It’s not like we squeaked in and went for a good run; we were a good team. Jody Hull, RW, Florida: I didn’t see Stanley Cup finalist, but I definitely felt we’d make the playoffs because we missed not by much our first two years. With the makeup of our team, I thought we’d have the ability to get in. Meanwhile, the Red Wings were also feeling pressure to win having been swept in the Stanley Cup final by the New Jersey Devils the year before. Kris Draper, LW, Detroit: You have to almost back it up a few years for the Red Wings. We got upset big-time by San Jose in the first round in 1994 and then there was the lockout year and we respond with an awesome regular season in the 48-game schedule and we go to the Stanley Cup final against the Devils. We’re the heavy favorites against New Jersey, but we hadn’t played an Eastern Conference team in the regular season so we didn’t know how big and strong the Devils were. We felt we had a lot of momentum going into the playoffs and there was an uncharacteristic long break between the Conference Final and the Stanley Cup final and I feel that hurt us. We get swept by New Jersey and now there’s a lot of doubt about the Red Wings. Are we too soft? To European? Too small? Do we have the right chemistry to take it to the next level? Then we come into the 1995-96 season and we have an OK start, but eventually we catch fire. That is the year we set the record for most wins in the regular season and once again we have created a lot of excitement and high expectations that this is going to be our year. The Avalanche was looking for playoff success after flopping in 1994-95 as the Nordiques. Perhaps a change of scenery would benefit this very talented group. Joe Sakic, C, Colorado: It was tough. We had pressure on us because we got eliminated the year before in the first round after finishing first. The Panthers opened the season on the road and came home for Game 2. 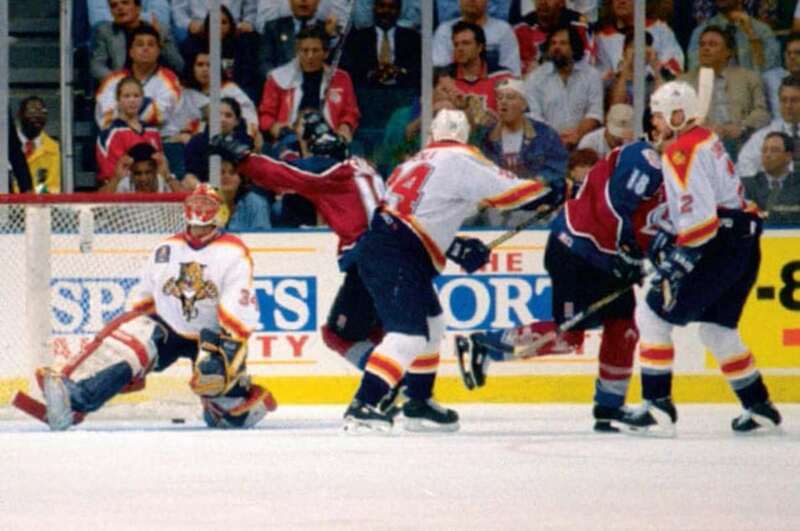 And that night the tradition of tossing rats onto the ice following a Panthers goal was born. Mellanby: We all have our pre-game rituals and the Miami Arena’s main tenant was the NBA’s Miami Heat so we had a really small dressing room. It was just a bunch of drywall that had been thrown up. There was this long hallway that went to the trainer’s room and our clothing room and my ritual was to stand and put my stick down on my knees and rock back and forth for a few minutes. All of a sudden we heard someone yell there’s a rat coming down the hall and it came scooting into our dressing room. It was in a small, confined area and I think the rat was as scared as anybody else. Some guys were screaming and I remember Paul Laus, our tough guy, jumping up on the bench. The rat scooted around the room and then it stopped and I swear it looked right at me and made a beeline for me. I just hammered the thing. It was the best one-timer of my career. It flew about 10 feet, hit the wall and it was dead. Then I scored two goals and ‘Beezer’ (John Vanbiesbrouck) said it was a ‘rat trick.’ We were being introduced before the game and I remember showing one of the guys the grey fur from the rat that was stuck to my stick. It was stuck on the tape. It is amazing that people still see me and say, “You’re the guy that killed the rat.” They’ll forget my name, but they remember the rat incident. 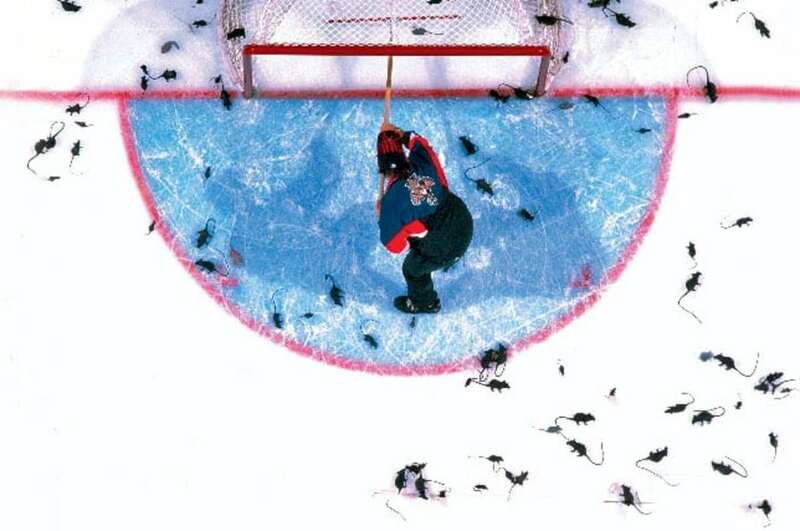 Hull: That was how the whole rat craze in Florida came to fruition and it’s nice to see watching the games today they are starting to throw them on the ice again. I still have some in my house as mementos of that season. Neilson did a great job with the Panthers before being replaced by MacLean who immediately made his mark and the player did not forget his contribution. John Vanbiesbrouck, G, Florida: We were molded and shaped by Neilson, a defensive style of game that is known as the trap. I give a lot of credit to Doug MacLean because he took that mold and said, ‘We’re going to go to this spot and that spot.’ Doug did a really nice job of making some adjustments, but the mold was built by Roger who wanted us to play a real staunch defensive style. Hull: Even though we had a new coach most of the players that were there were a bit of a reflection of the first two years. Doug was a little harder on guys making players more accountable and I think that might have been just enough to get us into the playoffs and ready to go for a bit of a run. Mellanby: Roger had huge input in our success and I am sure Doug would be the first to say that. The Red Wings were the NHL’s most dominant team in ’95-96, but it was the Avalanche that made the biggest headlines when it acquired goaltender Patrick Roy and veteran right winger Mike Keane in a trade with the Montreal Canadiens. Roy demanded to be traded after being pulled in a game against Detroit in which he allowed nine goals in an 11-1 loss. Roy had been the enemy of the Nordiques/Avalanche for so long and now he was one of them. Marc Crawford, coach, Colorado: It was surreal. I remember watching the game against Detroit on Saturday night and the next day we had a huge meeting. There was (assistant coaches) Joel Quenneville and Jacques Martin and (chief scout) Dave Draper; everybody in the organization. It was obvious GM Pierre Lacroix had talked to some people about Patrick and he knew what was going on. When we did get him it was one of those pinch-yourself moments. Mike Ricci, C, Colorado: At first, with the rivalry between Montreal and Quebec, it was kind of weird when Patrick walked into the room. I think he felt the same way. With that rivalry, we had to hate them. As he was on his way I am sure there were some guys thinking, ‘What the hell is going on here?’ It took about a day to realize that getting Patrick, as well as Mike Keane, we just became a really, really good hockey team. Sakic: He definitely was the enemy, that’s for sure. But you know what, it’s a funny thing, as soon as he’s on your team he’s your favorite player. That was Pierre’s way of saying, ‘Here’s your goalie. No more excuses. We’re here to win.’ We had a good team, but Patrick made us better. He was a proven winner and was a good leader. He made guys accountable. He was the guy who, at that time, you’d say if you had to win one hockey game, he was the guy you’d go with. Draper: We already knew with Forsberg, Sakic, Lemieux, Mike Ricci, Adam Foote and the other players they had, it was going to be a heck of a Western Conference final. Then they go out and get Patrick Roy. The Panthers finished the regular season 41-31-10, all in all a good year, but there were bumps along the way. MacLean: I think back to a turning point in the season and we got beat 7-2 in Montreal. I was wild after the game. It was going to be a good night in Montreal; time for the guys to let their hair down and after the game I said, “Be on the bus in your equipment at 8 a.m. because we’re going to Verdun to practice.” So much for the day off. They were sour; I was sour. I get on the bus the next morning and all the boys are getting on and I’m looking at them and I’m sour. I can they are hung over and pissed off. Skrudland is the last guy to get on the bus and he has his helmet on and he has a beer bottle taped to the top of his helmet. He walks by me and says, ‘Good morning coach.’ The guys broke up. There was so much tension on that bus and they just started roaring in laughter. We went to Verdun and had one of our best practices of the year. Skrudland broke the tension and that’s what he did all the time. When the playoffs arrived, the Red Wings were the No. 1 seed and the Avalanche No. 2 in the Western Conference, while the Panthers were No. 4 in the East. Florida eliminated the Boston Bruins, who had finished one point them in the regular season, in five games, while Colorado took out the Vancouver Canucks in six. Sakic: It was 2-2 against Vancouver, Game 5 was at home and we were down two late in the game. We had a 5-on-3 and ended up scoring, then tying the game late and winning in overtime. If we lose that game and go back down to Vancouver down 3-2, who knows how things would have ended? Hull: We had a plan going in and every line knew what its role was and who it would be playing against and that was our total focus for that series. We knew if we could shut down Ray Bourque and Adam Oates that would give us the best chance to win. We did that pretty successfully. At the end of the day you have to know what you are focused on and what the strength of your team is. Most of the players on our team were smart, two-way hockey players who put a little bit more emphasis on the defensive side of the game. We were able to nail down stuff defensively so that we didn’t give the other team a lot of offensive opportunities. I played with Tom Fitzgerald and Bill Lindsay and we were on the ice every time Ray Bourque was. Tommy and I joked that all we had to do was dump the puck into Billy’s corner and he’ll go after Bourque and try to hit him every time. By Game 3 Ray was making his partner go back for pucks because he was sick of chasing pucks and getting hit every time. When he doesn’t have the puck on his stick things won’t happen as fast for the Bruins and he’s not making those special plays. In the second round, the Avalanche ousted the Chicago Blackhawks in six games, while the Panthers did the same with the big and tough Philadelphia Flyers. Hull: We had to play against the Legion of Doom (Eric Lindros between John LeClair and Mikael Renberg) and they were at the height of their success as a line. The biggest factor is we had a young guy in Ed Jovanovski who was in his first year and 19 years old. He singlehandedly took on Lindros. Every time he could get a lick on him, he got a lick on him. It wasn’t just a little bump, it was a big hit. It got to the point that every time Eric was on the ice and Eddie was out there Eric was like, ‘Here we go again. He’s going to try to hit me.’ Eventually it caught up to him and I think in Game 5 in their building we won in overtime and you could sense our team knew we would win the series. MacLean: Early on ‘Jovo’ rocked Lindros with a big hit and it set the tone for the rest of the series. Also, Rob Niedermayer went head-to-head every shift with Lindros. What a job he did matching up against the most dominant player in the world at the time. Mellanby: It was phenomenal. Jovanovski was a young kid, full of piss and vinegar and confidence. He was not daunted by the task; he embraced it. He was a tough player who wasn’t afraid to drop the gloves and he was hard to play against. At some point it had to get under Eric’s skin. The Avalanche and Red Wings each knew they would have to go through the other in order to make it to the Stanley Cup final. The Detroit-Colorado series was not only one of the most memorable of all-time, it started a rivalry that would burn brightly for years. Draper: The hatred was there, but I think there was a deep down respect that both teams had unbelievable talent. The rivalry we had with Colorado was probably the nastiest in all of professional sports. Nobody was even trying to be politically correct with that rivalry. It was plain and simple: They hated us, we hated them. We wanted to beat them every way possible. We wanted to physically beat them, beat them on the scoreboard. We wanted, in a regular season game, to do everything we could to walk out of that building with a win and I’m sure they felt the exact same. Ricci: You have kids going off to war and getting killed. Those guys are real heroes. But in our little world, that was war. Losing a playoff series was dying. When we walked into Joe Louis Arena, something different was going on. This was going to be a battle. You could smell the hatred. It didn’t take much to get up for those games. It is actually a feeling you want to feed off. Draper: People talk about the rivalry and hatred, but I think to a lesser extent it overshadows the great hockey that was always played when our two teams met. They had all their stars, but we had Fedorov, Larionov, Yzerman, Lidstrom. Every year there was somebody going into the Hall of Fame that was part of the Colorado Avalanche or Detroit Red Wings. The hockey was always physical. You could say both teams hated each other and I truly think that was the case from ’96 to ’02. They didn’t like us, we didn’t like them. Sakic: Rivalries always start in the playoffs. We had just moved to Colorado so there really wasn’t much of a rivalry between the two teams. The last regular season game in Detroit in March we lost 7-0 and that was what taught us that we had to tighten up and play a lot differently in the playoffs. We could score and we were run-and-gun up to that point, but we knew we had to learn to play both ends. Winning Games 1 and 2 in Detroit gave us confidence. Beating them when they were such a favorite and then, obviously, the Lemieux hit, served to raise the intensity of the rivalry. The Lemieux hit. In Game 6 the Avalanche grinder hit Draper from behind driving his face into the boards. Draper suffered a broken jaw, cheekbone and nose and suffered a concussion. Ricci: It was one of those things. I felt like it was a hockey play, but obviously Drapes got really hurt. At the time we all said things we probably should not have said. When a guy gets his face broken like that it’s hard to say it’s just a hockey play, but at the time that’s what it felt like. It didn’t seem as bad as it really was. After eliminating Boston and Philadelphia, the Panthers turned their sights on the Pittsburgh Penguins who had two superstars, Mario Lemieux and Jaromir Jagr. Florida won a hard-fought seven-game series. Vanbiesbrouck: They were so talented, but our guys played their talent really hard. It is easy to say and a little clichéd, but the guys really sacrificed … We just tried to frustrate them, get them to turn over a couple of pucks and hope we could score a few goals. We played Mario and Jagr really hard and didn’t give them a ton of chances. Ultimately that is why we survived. Mellanby: You look at where the game was at with some of the hooking and holding that was going on. You could get away with a lot and we had an elite goaltender and a great coach with Roger first and then Doug who brought some character and presence to what we were all about. We were a bunch of third-line guys and maybe some second-line guys, but we were coachable and the game at that time enabled our system to be successful. You wouldn’t get away with a lot of what we did nowadays. Hull: We didn’t really have to change anything because we were winning. We stayed with what was working for us and the nice thing about that entire run in the playoffs was we weren’t relying on one guy or one line. Obviously we needed Beezer to be good in net for us, but we weren’t looking at one or two guys to score goals for us. We were getting contributions from every guy and it was a different guy every night stepping up and being ‘the guy’ for us. Who do you look after if you are the other team? Who do you try to stop? After eliminating the Penguins, the Panthers headed directly to Colorado to start the Stanley Cup final three days later. It’s hard to say if things would have been different if the Panthers were able to go home for a few days. The Avalanche won the final in four straight. Game 2 was a blowout, 8-1 for Colorado, but the other three games were close, 3-1, 3-2 and 1-0 in triple overtime. Mellanby: We had confidence that we were a good team and we had a four-line system so we could wear teams down. We felt Boston had one really good line and we’d say, ‘Four beats one.’ Then we played Philly and they had two good lines so we’d say, ‘Four beats two.’ Then against Pittsburgh they had two good lines so, ‘Four beats two.’ When we got to Colorado they, like us, had four good lines and their higher-end guys were higher than ours. Ricci: Our coaching staff made sure we were ready. They said if we were prepared to work they were not going to beat us. It wasn’t an X’s and O’s thing, it was simply that we had to outwork them. It was one of those series that ended up 4-0 and maybe people thought it was easy, but it wasn’t. The Panthers played so hard we had to work every shift. Hull: We had just come off a hard-fought six-game series against Philadelphia and right into a seven-game series with Pittsburgh, but Colorado was special. They had 1A, 1B and 1C lines. You had to pick your poison. Mellanby: I think my heart would like to tell me that with a little rest before the final it might have been different, but now that I am almost 50 years old my head is willing to say they were just the better team. With no disrespect to guys like Rob Niedermayer, myself and Johan Garpenlov, we were the top line and they would roll out Sakic’s line and then Forsberg’s line and we just weren’t good enough. This is an edited version of a feature that appeared in the Playoff Preview edition of The Hockey News magazine. Get in-depth features like this one, and much more, by subscribing now. Mike Brophy is a veteran journalist who was a senior writer at The Hockey News for 17 years. He loves The Beatles and freely admits he is not among the three million people who claim to have attended the group's Sept. 7, 1964 concert at Maple Leaf Gardens.